How do I get a picky husband to eat broccoli and cauliflower? I use stir fry sauce. I had half a bag of rice noodles and a bag of frozen veggies and decided to try a new stir fry sauce. Lately I have been using a honey teriyaki recipe but I found Tomato Boots’ recipe on Pinterest. It is so easy and delicious and I already had all the ingredients in my pantry. I bought precooked frozen shrimp (tails on) and thawed overnight in the refrigerator. Total prep and cook time was about 30 minutes. Here’s my take on shrimp and veggie stir fry over rice noodles. If using frozen shrimp: Once thawed, place in colander over the sink and rinse with water. Remove tails from shrimp and place in bowl, set aside. Fill a large pot with water and place on high heat. Microwave your frozen vegetables. I deduct about a minute to the minimum time according to the package since they will also be heated on the stove. While vegetables cook in microwave, heat a large skillet/pan to medium. While noodles cook, microwave sauce till warm, about 1 minute, stir. Sauce will thicken. Place shrimp in pan. Pour half the sauce in the pan and carefully stir. Add vegetables, stir. Allow shrimp and vegetables to heat in pan while you drain your noodles. 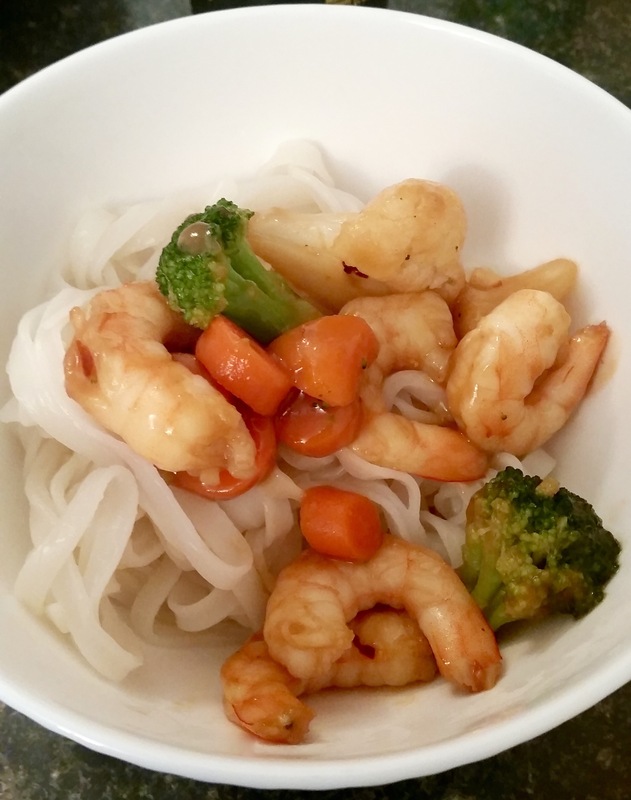 Place noodles in a bowl, top with shrimp and vegetable stir fry. If desired, add soy sauce or Yum Yum sauce (I topped mine with both sauces).